The actors are devoted to using their celebrity for a good cause, promoting volunteerism with New York City's Mayor Michael Bloomberg last Sept., and recently taking up the cause of child exploitation and human trafficking. "It's something that we looked at together and we've done a lot of research on," Kutcher discussed with Lisa Ling on Oprah.com. "It's time to make it an agenda item." "Ashton's relationship with his own mother is really wonderful, so it made the transition to being with a woman with daughters something he didn't bat an eye at," Moore told V magazine. 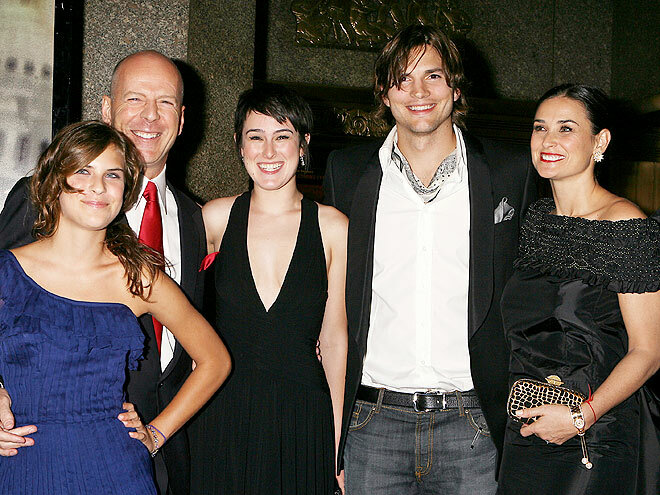 In addition to being close with Moore's girls Tallulah, Rumer and Scout (not pictured), the actor also maintains a friendly relationship with her ex Bruce Willis, who even guest-starred on That '70s Show with Kutcher! Whether checking out a New York Yankees-Los Angeles Dodgers game or flaunting their gym-toned bodies on a vacation to the Caribbean, the happy couple know it's important to take time for each other. Amid tabloid reports of cheating, Ashton Kutcher took to Twitter, calling the charges "defamation of character." 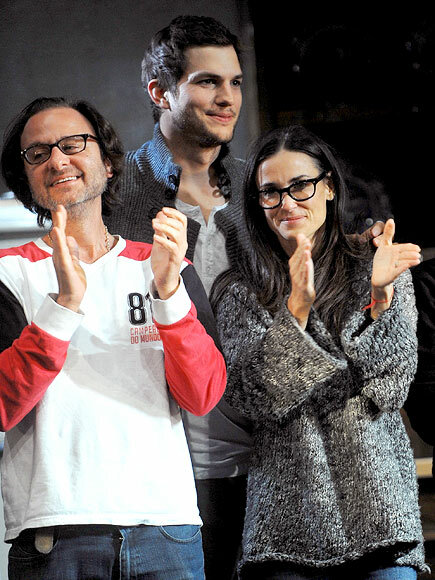 Demi Moore agreed, Tweeting her support of her husband and sharing photos of the two together on the set of her movie The Reasonable Bunch and breaking their fast for Yom Kippur with a trip to Applebee's. As a friend recently told PEOPLE, the twosome seem "super committed". Moore stands by her man at the premiere of his movie Spread, while Kutcher supports his wife for Flawless. When their respective jobs call for a red carpet appearance, both will be there. It's much more glam than their first date: "We had In-N-Out [Burger] Kutcher said. "It's hard to beat that." They gave their regards to Broadway last November as Kutcher made his Great White Way debut alongside his wife (and Eva Mendes and Fisher Stevens) in The 24 Hour Plays, a benefit for the Urban Arts Partnership, a charity supporting arts in N.Y.C. public schools. Moore even showed up when Kutcher hosted Saturday Night Live in 2005 – and mocked their age gap dressing like an elderly woman. "Your man should not upstage you," Kutcher once wrote in Harper's Bazaar in an essay about fashion. "He is there to highlight you." He lives up to his words, often opting for soft tones to accent his wife (right, promoting her Wanted perfume; left, in pinstripes at 2008's Chrysalis Butterfly Ball). "I hate Valentine's Day. I think every day should be a day of romance," Kutcher recently said – and boy, does he mean it! Whether snuggling on the red carpet – or posting their racy plans for the night on Twitter – Moore and Kutcher have no problem celebrating their love publicly. Moore recently posted this shot, writing, "Race u to the bedroom" on her hand. Naughty!